The ICM Remote Sprayer Platform was demonstrated on June 24-25, 2010, at the International Climbing Machine (ICM) facility in Ithaca, NY, under a contract with Florida International University’s Applied Research Center. 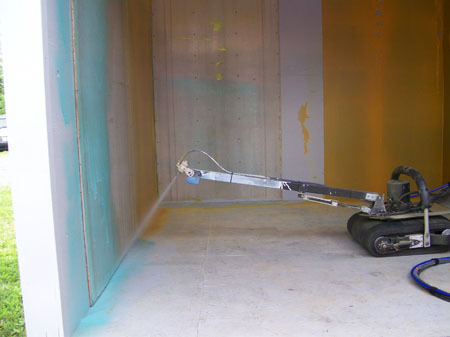 The objective of the technology evaluation was to document the ability of the remote system to spray three different strippable coating products (Instacote CC Strip, Carboline ALARA 1146, and CBI Polymers DeconGel) onto vertical concrete and metal surfaces. ICM climbers are remote-controlled climbing machines that weigh approximately 30 pounds and have a pull off strength of over 225 pounds. 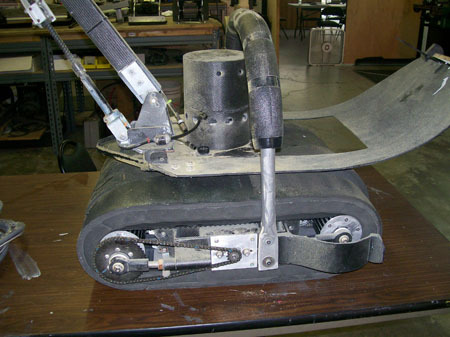 Held to the surface by vacuum force, the machines adhere to essentially any hard surface such as metal, concrete, or brick. The ICM climbing machines are remotely controlled by an operator from a control station, allowing the machine to access areas unsafe for manual D&D activities. 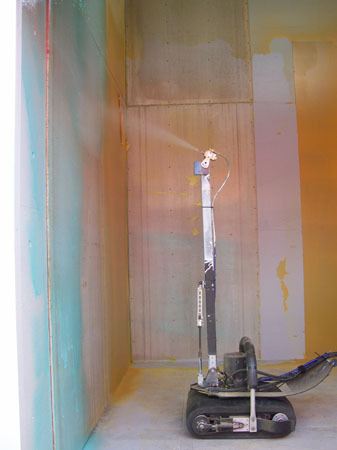 For the purposes of this technology demonstration, the ICM climber was modified with a spray applicator. The technology successfully demonstrated its ability to spray the three different products onto vertical concrete and metal surfaces. The technology was able to travel across the floor of the building module and climb the walls unassisted while being controlled remotely by the operator. The technology sprayed the products to the vertical wall surfaces and a sufficient thickness of each product was achieved to promote the ability of the product to be stripped from the surface once dry. Overall, the three products sprayed well and were relatively easy to strip, once dry, from the stainless steel and concrete panels.